Photographer Jeff Dai captured this view of a Perseid meteor shower fireball streaks above the city lights of Nanchuan in western China on Aug. 11, 2013. Dai took the photo from Mount Jinfo, Chongqing, China. Editor's update (Aug. 12, 2014): The 2014 Perseid meteor shower is peaking now and you can watch it live online tonight. 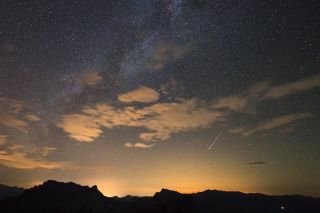 Find out how with our latest story: Perseid Meteor Shower Peaks Tonight: Watch It Live Online. The annual Perseid meteor shower created by leftover bits of a comet is at its best in the night sky now, but there are a few tips to keep in mind to make the most the cosmic fireworks show. The 2013 Perseid meteor shower will peak in the late overnight hours of Sunday and Monday (Aug. 11 and 12), and could light up the night sky with up to 100 meteors an hour for stargazers with the best viewing conditions. To see the most meteors, you will need clear weather and a dark sky far from the interference of bright city lights. John Chumack sent in a photo of a Perseid meteor over Dayton, OH. He writes: "My meteor video camera network picked up about 2 dozen Perseid meteors coming out of the northeastern sky." Image acquired August 4, 2013. The Perseids appear to radiate out of the constellation Perseus, which is how they get their name. The constellation is currently in the northeastern night sky after sunset, but observers will likely see more meteors by looking straight up, and not directly at the constellation, NASA scientists have said. If bad weather spoils your Perseids viewing, don't fret. You can also watch the meteor display online tonight in two free webcasts. You can watch the Perseid meteor shower webcasts live on SPACE.com, courtesy of NASA and the Slooh Space Camera. Beginning at nightfall, NASA's all-sky camera at the Marshall Space Flight Center in Huntsville, Ala., will offer a live view of the night sky and any meteors that flare up overhead. The webcast caught 14 Perseid meteors during its first night on Saturday (Aug. 10), MSFC officials said. At 7 p.m. EDT (2300 GMT) tonight, the Slooh Space Camera, an online stargazing website that uses remotely operated telescopes, will offer a free webcast from its observatory on Mt. Tiede in the Canary Islands, off the western coast of Africa. You can watch the feed on SPACE.com or directly from Slooh via the Slooh Space Camera website. This NASA graphic shows the location of the Perseid Meteor Shower radiant in the night sky during 2013 peak on Aug. 12 and 13. Skywatchers around the world have already begun enjoying the Perseid meteor shower. Photographer Jeff Dai joined a group of stargazers in China who ventured up Mount Jinfo in Chongqing to observe the celestial display. "Our 10-man group enjoyed more than 300 meteors early this morning," Dai told SPACE.com in an email today. "The waves of cheering lasted all night." The Perseid meteor shower occurs each year in min-August when the Earth passes through a dusty trail of leftovers from Comet Swift-Tuttle, a comet that orbits the sun once every 133 years. Most of this comet debris, which is made up of bits of ice and dust, is more than 1,000 years old, according to a NASA description. As the Earth passes through the Swift-Tuttle debris stream, the ice and dust fragments slam into the atmosphere and burn up, creating one of the best meteor showers of the year for stargazers. Get comfortable: Staring up at the night sky from the ground or a standing position can be tiring on your neck. Consider a reclining lawn chair to stay comfortable. Stay warm: It can get chilly at night, even in the summer, so a light jacket or windbreaker might be just what you need to avoid dipping back inside and ruining your night vision. Editor's Note: If you snap an amazing picture of the 2013 Perseid meteor shower or any other night sky view that you'd like to share for a possible story or image gallery, send photos, comments and your name and location to managing editor Tariq Malik at spacephotos@space.com.